Happy leap day. 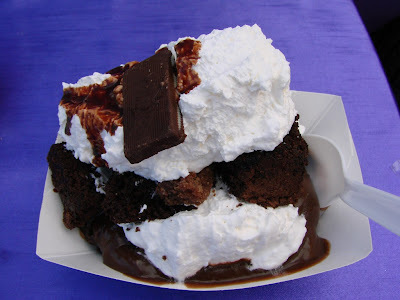 We continue our Eat The Street: Chocolate series with this offering from Chicago Eatz. It is something that just has to be tried especially with the chocolate theme. 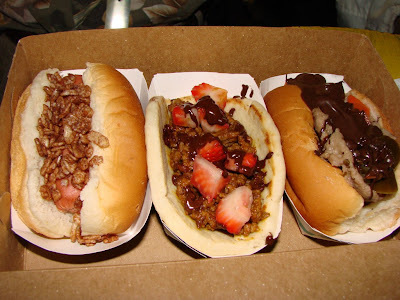 From left to right the Cocoa Krispies Hot Dog, Choco-Taco with dark chocolate and strawberry topping and chocolate dipped Italian beef. The presentation was awesome as they went all out to meet the theme. The dishes were certainly interesting and a nice way to challenge the taste buds. I did notice on their menu they have a Gyrami (a mix of a gyro and pastrami) that I will have to put on my list of things to try next time. 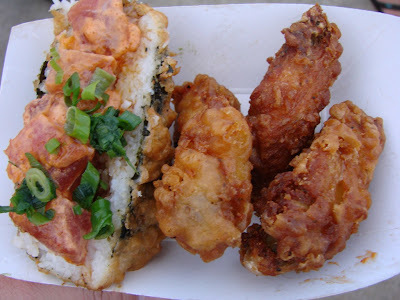 Not all the food consumed can be chocolate (though I do have a friend or two that would not agree) so I hopped over to Hawaii’s Fried Musubi which has been one of the trucks I’ve always wanted to try because as their motto says “Everything tastes better fried”. Here is their Spicy bomb with mama’s secret recipe fried chicken plate. If you ever see this truck at an event with a short line race there because soon the line will be super long. The musubi is furikaki encrusted and flash fried. The nori reminded me of that deep fried nori you can get at Costco (also yummy). This was a nice combination just the right crispiness… next time I’ll have to try their classic deep fried spam musubi. I thought it was a little pricy at $9.50 but both the musubi and the chicken tasted awesome. I was going to come back later for the fried red velvet cupcake but by the the line was too long so I’ll save that for a future visit. I also snuck a bite of my friends deep fried peanut butter and jelly sandwich and it was so goey and delicious. I think everything does taste better deep fried. Today we begin a food series from the February Eat the Street food truck & street food rally. The February theme was chocolate so what better way to kick this off but with the “Death by Chocolate” trifle by Fairycakes. This “mobile cakery” is know for their Whoopie or Fairycakes which are light dessert sandwiches. But they went all out for this event with chocolate cake and monster brownie covered with homemade chocolate pudding and fresh whipped cream. Top all that with hot fudge and an Andes mint and you have a killer dessert.